The jury deciding the fate of Christopher Calvin Garnier heard him tell police that his hands were around Catherine Campbell’s neck before she died. The seven-man, seven-woman jury watch the final hours of the nine hour and 24-minute-long video interrogation of Garnier, 30, in Nova Scotia Supreme Court on Thursday. The video was recorded after his arrest on Sept. 16, 2015. The Crown alleges Garnier killed Campbell, 36, by strangulation after they left the Halifax Alehouse and went back to an apartment belonging to Garnier’s friend. Garnier has pleaded not guilty to second degree murder and improper interference with human remains. In the interrogation video, Cpl. Joseph Allison and Det. Const. Michelle Dooks-Fahie ask Garnier for his version of events the night Campbell disappeared, Sept. 11, 2015. Garnier cries throughout the interrogation, saying repeatedly that he cannot talk. Eventually, Garnier said he believes he hit Campbell in the face quickly two or three times, causing her nose to bleed. He then wrapped his hands around her neck. Garnier said he took his hands off of Campbell’s neck when she began to gasp and heard her last breaths from the doorway of the room they were in. “I didn’t realize what I was doing until I was doing it,” Garnier said in the video. Dooks-Fahie then asked what he did after he realized something was wrong. “At that point it was too late,” replied Garnier. Allison and Dooks-Fahie also asked Garnier to physically demonstrate how he put his hands around Campbell’s neck. “Do I really have to?” asked Garnier. He held up his hands in a hook position after Dooks-Fahie clarified he did not have to touch her. 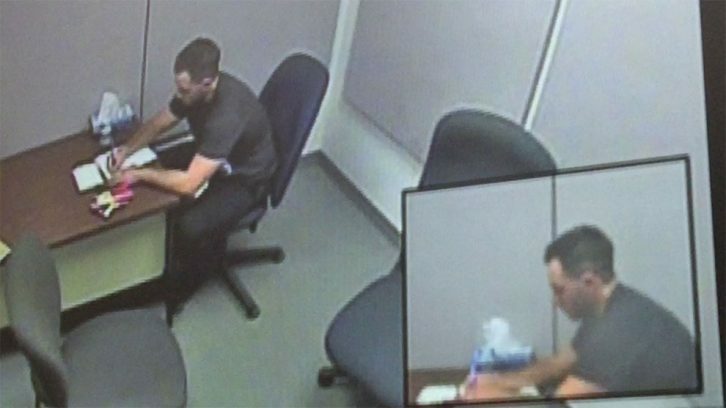 In the final hours of the interrogation video Garnier is left alone in the interview room. Allison reminds him before exiting that they have left a piece of paper there should he want to write anything down. Previously Allison had mentioned Garnier could write something to Campbell’s family, his own family or his girlfriend, Brittany Francis, if he chose to. 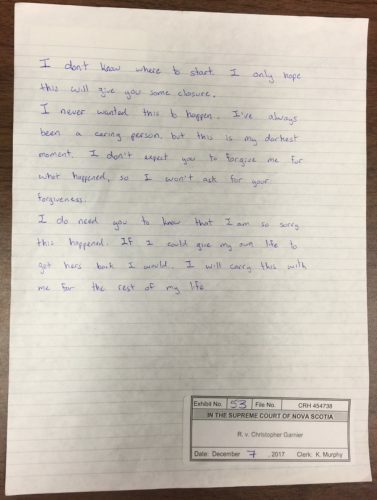 Sniffling, Garnier wrote a note apologizing for what happened, which he later told Allison was for the loved ones of Campbell. “I don’t know where to start. I only hope this will give you some closure,” the note begins. The note was read aloud in the interview by Allison. In cross-examination, Garnier’s lawyer, Joel Pink, asked Allison if it was true that Garnier had spoken to a lawyer before the interrogation and was choosing to exercise his right to remain silent. Allison said that it was. Pink then asked if Allison continued to interrogate Garnier and Allison replied that he did. Allison said, in the context of the whole interview and the theme he was developing, he was being truthful. In the Crown’s redirect, Allison clarified that he often tries to develop a theme in interviews so the person he is interviewing feels comfortable talking to him. The jury also heard admissions read into the record by the Crown, confirming the credibility of expert witnesses and several small details of the case. The trial is scheduled to reconvene on Monday at 9:30 a.m.